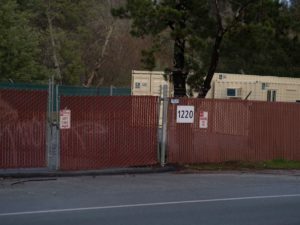 The city of Santa Cruz will pursue a different plan to address houselessness after backing out of a plan to construct a public storage center for the houseless community. The gravel lot ringed by barbed wire fence at 1220 River St., formerly slated for the storage center, will instead become a year-round, tent-based shelter. The eventual goal is to replace San Lorenzo Park as the primary “campground” for houseless persons in Santa Cruz, said Santa Cruz City principal management analyst Susie O’Hara. The plan currently has no definite timetable, and the city has not yet selected an operator for the new facility. City on a Hill Press previously reported the city of Santa Cruz was pursuing the creation of a storage program to serve the city’s houseless community. Houseless persons currently have to find someone to guard their belongings or risk having everything they own being stolen in order to access or participate in various services and programs. Barbed wire and a 24-hour police presence will maintain the no walk-on/walk-off policy at the River Street site, a policy intended to protect the houseless population camped inside. Many fear that these policies, as well as the inconvenient location of the camp, will deter the houseless population from using these resources. The industrial containers for the storage facility had already been purchased and transported to the proposed site. The city was in talks with the Santa Cruz Warming Center to operate the program and city manager Martín Bernal said it could be expected to launch at some point in December. The River Street site and its accompanying programs will largely be inspired by the San Diego model, first implemented in October 2017 in San Diego’s city-sanctioned houseless encampment. The San Diego encampment was created as a direct response to the Hepatitis A epidemic and the model calls for strict security measures. Houseless persons who live at the campground will only be able to leave or return to the campground via a periodic shuttle service, and the no walk-on/walk-off policy will be strictly enforced. The city still plans to use the industrial containers already on-site for storage in the new River Street campsite. In fact, O’Hara said the city prioritized developing the new campsite in part due to the practicality and efficiency of having the storage facility and the encampment in the same location. The city is currently negotiating with prospective nonprofit partners to operate the program, and has no timetable beyond “as soon as feasible,” O’Hara said. Warming Center co-founder Brent Adams said despite negotiations for a storage facility falling through, the Warming Center plans to pursue the creation of its own storage program without city funding.